Decorated Halloween cookies were the chosen creation for this month's baking club. I have a greater appreciation for those fancy decorated sugar cookies now. Cookie decorating is an art form! The "crème de la crème decorated cookies" are generally made with royal icing. Royal icing can be a bit of a royal pain. It is a hard white icing made from egg whites and confectioners' sugar. There are different techniques for decorating cookies using royal icing, which involves outlining and flooding. The right consistency of the icing is critical. For more detailed decorating, you need to allow the royal icing to dry, and then you can pipe more detailed designs on top of the original icing layer. ICE ICE BABY! I'm still learning how to get that right consistency, and practice will make perfect! 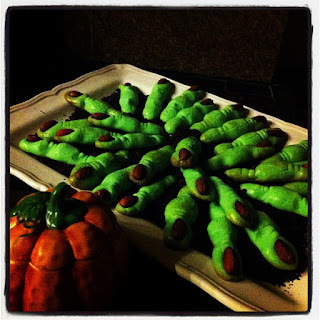 (Whoa…I just integrated Vanilla Ice into a post about Halloween cookies. Now THAT is scary.) My original batch of royal icing cookies ended up having icing that was a little too runny. As a result, the icing permeated a little too deep into the cookie, turning them into mush. Even though we had a Halloween theme, "mush" cookies would be a little too gross and scary to eat. Fortunately, I was not the only baking club member to have a love-hate relationship with royal icing. We all exchanged e-mails about how fingers were stained with royal icing colors, icing was on the walls, and even our dogs had some icing. Parsley Sage over at the Deep Dish partnered with Cayke for some royal icing tips. The best tip? KEEP IT SIMPLE! I planned for another round with royal icing, but then the stomach flu fairy paid me a visit. By the time I was feeling well enough to return to the kitchen, there was not much time left, unfortunately. So, it was time to improvise with this spooky cookie! This cookie tastes like a light shortbread with almond flavor. The cookies are sitting on top of some crushed Oreos so that they appear to be in dirt and coming out from the ground! It might be fun to add some strawberry jam at the nail head (before adding the almond) because then it would look like blood was oozing out of the nail. These are spooky yet cute, making them perfect for Halloween! Make sure to check out the creative creations of my fellow bloggers over at the Deep Dish, the Orgasmic Chef, and From My Sweet Heart! In the bowl of a stand mixer (or in a medium bowl with a hand mixer), combine the butter and sugars, beating on medium-high speed until light and fluffy, about 3 minutes. Add the egg, egg yolk, almond extract, and salt, and mix until combine. Add the flour on low speed until combined. If desired, add food coloring to tint the dough. Then, form the dough into a ball, cover with plastic wrap, and refrigerate for at least an hour, or until firm. When you are ready to bake the cookies, preheat the oven to 350ºF. Line baking sheets with parchment paper or silicone baking mats. Divide the dough in half. With one half of the dough chilled, divide the the first half into 15 equal pieces. On a lightly floured surface, roll each piece into a finger shape about 4 inches long. Pinch each piece of dough in two places to create a knuckle shape. Use a small paring knife to lightly score the surface of the knuckles. Transfer the fingers to the prepared baking sheets, and repeat with the second half of the dough. After all of the cookies are formed, lightly brush with the lightly beaten egg white and position an almond at the end of each finger, and push lightly into the dough to attach. Bake until set, about 10-12 minutes. Remove the cookies from the oven and allow to cool. Note: If the cookies have spread or lost shape after removing from the oven, you can reform them gently while they are still warm but cool enough to handle. I tried these last year with a "tried and true" recipe (according to the blogger) and I followed it perfectly - weighed too. 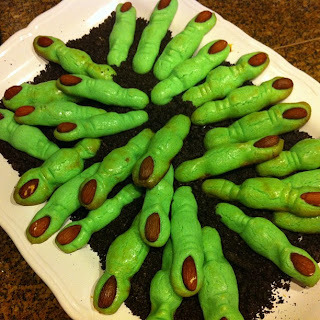 I pulled these fingers out of the oven that looked like they'd been run over by a truck :) Adapted version looked really spooky. Not sure they were as good as yours though. House is (finally) clean and I'm ready for the next challenge, ma'am. These are fantastic! YOU are creative too, my friend! Claire...these are just fabulous! How really clever and I bet they are just delicious! Sorry I had to sit this one out! I think I am finally on the mend and hope that you've been feeling better, too!